Musicians, artists, and music business entrepreneurs need cash to start a project and nurture it to fruition. They are hardly unique in this respect, and face many of the considerations that the general public does: i.e. is the need for money for the short term or for the long term, is there a small or a large amount of risk involved? Today, fortunately, there is more flexibility in the marketplace. Resources can be marshaled on a piecemeal basis, as needed by entrepreneurs or musicians to achieve a particular and often tactical goal. Crowdfunding and venture capital are two examples of a new type of milestone or ad hoc financing that both blurs the distinction between short and long money and helps defray risk. The implication for artists, musicians, and music business entrepreneurs could be momentous. This paper will focus on crowdfunding only. 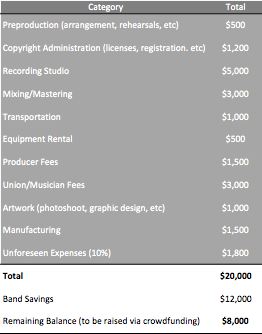 It suggests a simple methodology for a musician or music entrepreneur to budget her own project. 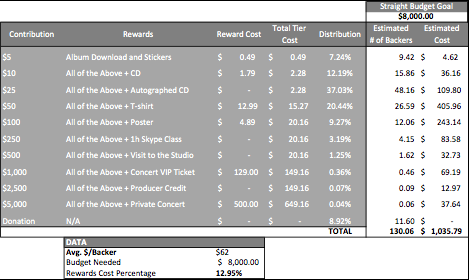 The costs of rewards for fans are variable and depend on the number and category of fan pledges. Knowing ahead of time what the possible distribution of such rewards may be is key, and so is the understanding of the average pledge per contributor gathered from historical data. The authors argue that raising funds online in return for rewards is based on too much guessing, when it should be more informed. Starting from recent Kickstarter data, they show, step by step and with a spreadsheet, how to prepare a professional crowdfunding budget that includes taxes, service fees, and contingency arrears. This type of budgeting is not as obvious as it seems, and the paper fills a gap in the current music business literature. More than fifteen years ago, when the World Wide Web was still in its early years and its full potential as a social network was yet to be revealed, the British band Marillon was able to raise $60,000 to finance their US tour through an Internet campaign. In the following years, we witnessed the rising of collective financing online.1 The music website ArtistShare was created in 2000, becoming the first online platform for fanfunding, successfully raising funds for a Grammy Award-winning album by Maria Schneider, amongst other projects.2 Since then, raising funds using the Internet has grown by leaps and bounds. Today, crowdfunding is incorporated in the vocabulary, meaning online contributions by the general public, above all, to a diverse pool of creative projects. Gradually, other online platforms actually crowded ArtistShare out–notably among them, Kickstarter. Kickstarter broke the music financing record with Amanda Palmer’s $1.2 million campaign, which paid for her new album and tour.3 The power of crowdfunding seems to grow by the day and the phenomenon now goes well beyond music. Recently, Ouya brought to market, also with Kickstarter, an Android-based videogame console: the required pledge of $950K led to collections of $8.5 million, with 63K contributors advancing, on average, $135 each.4 The total compares in size to a first round of venture financing. According to Crowdsourcing.org, a trade organization, there are currently four categories of crowdfunding platforms available on the Internet, defined as Equity-based, Lending-based, Reward-based, and Donation-based.5 In the first two, contributors expect financial returns in exchange for their pledges; in the reward-based model, a person contributes to a campaign in exchange for a reward and the degree of exclusivity in those rewards generally grows with the size of the contribution; finally, in donation-based crowdfunding funders contribute without expecting anything in return because the project appeals to their personal beliefs. However, the most popular crowdfunding model is still the rewards-based model, representing 43% of the global crowdfunding industry, with an expected market growth of 524% in the next year.6 There are an increasing number of crowdfunding platforms in this category such as Indiegogo, Pledge Music, Rockethub, and, of course, Kickstarter, which we will use as a reference in this paper because it is the largest and most widely known. The rewards-based crowdfunding model strongly appeals to music projects because it permits artists to raise funds before they start working on the project; the project can be executed only if the goal is met. Artists can then cover their production costs, and possibly break even before the project even starts. Kickstarter launched more than 22,000 music campaigns in its four-year lifespan; however, only around 54% have succeeded in reaching the campaign goal.7 That means that one in two projects fail to raise the necessary money. Most importantly, but less discussed, is the fact that even when they succeed in meeting their goal, project owners might have not budgeted correctly, having to access other funds to conclude the project, delaying the expected delivery date of the campaign, and sometimes never fulfilling the project. Since crowdfunding functions also as a marketing platform, non-fulfillment, or less-than-par fulfillment, jeopardizes the image of artists, and make them lose credibility with their fans. The reason for these failures is that most of the campaigns are being planned based on guesswork and misconception. On guesswork: Despite the availability of general data provided by some of the crowdfunding platforms, a more professional and statistical approach is missing. It would be extremely useful for new music projects to use the information available in order to realistically set goals and more accurately estimate the number of contributors needed to realize a successful endeavor. On misconception: Successful campaigns fail at the fulfillment stage if the campaign asks only for the amount needed to realize the project, i.e.it seeks only to cover the studio costs to record an album, or the price of a van for a band to go on tour. Yet the costs of raising money via crowdfunding far exceed the initial budget goal of the project, and include the costs of delivering the rewards, platform fees, taxes and other unexpected costs. The fact is that budgeting for a crowdfunding campaign is often problematic because it is difficult to know ahead of time what the possible distribution of rewards that fans will choose will be. Moreover, it is even harder to guess what an average pledge can be, and this is a critical piece for a successful crowdfunding campaign. In this paper we have compiled information from one hundred successfully funded Kickstarter music projects completed between February 11 and 23, 2013. However, any crowdfunding campaign would have to start from current examples of comparable campaigns, and the main object of the paper is to outline a simple methodology for a musician or music entrepreneur to properly budget his or her own crowdfunding campaign. Therefore, more data points than one hundred campaigns would have added only marginally to the value of the paper. If the method is understood, the user can update the Excel template that is supplied at http://bit.ly/13taRoN, with current data and be as thorough as he or she wishes. As budgeting properly for crowdfunding rewards is a craft that is learnt only by doing the numbers, we recommend that the reader plough through the various sheets of our Excel template, either in unison while reading the rest of the paper or even ahead of the following text. Researching similar campaigns to the one in mind is critical. It can bring fresh ideas to the table, perfect a pitch, better define a product, find potential partners, and get insights for different offerings. Scott Steinberg, in his book The Crowdfunding Bible, offers a comprehensive list of what to look for.8 Additionally, compiling data from similar projects might be a very useful tool for correctly budgeting a campaign, especially because it can offer examples of how contributors were distributed amongst the different tiers of rewards in successful campaigns, and what the average pledge per backer was. It turns out that both metrics are the two key drivers in the budgeting methodology we are now proposing. Indiegogo’s help desk suggests a simple calculation to estimate the number of backers a project will require, i.e. “divide your goal amount by 100, [and this will be] the estimate of how many people need to donate to your campaign in order to meet your goal.”11 An Indiegogo blog post does suggest how to price perks: “perks at the $25 level are the most popular and help you extend your network and boost publicity; perks in the $51-100 range will support the bulk of your fundraising”.12 Two interesting graphics are also offered revealing (i) the percent of pledges by perk amount, and (ii) the percent of total dollars raised by perk amount. However, once again, the data set is not exclusively about music projects. 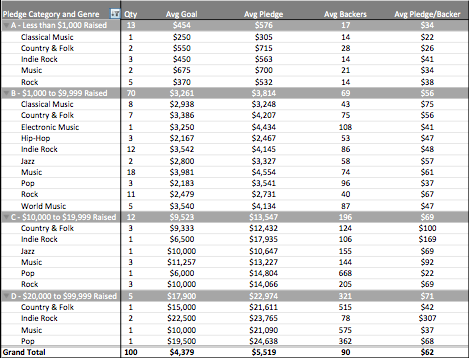 As mentioned, we analyzed one hundred successfully funded music projects from Kickstarter. Our sample size is representative of the entire range of music projects on the Kickstarter platform, specially considering the pledge categories as defined on the Kickstarter Statistics page.15 Most successfully funded music projects raised between $1,000 and $9,999. We have left out of our sample pledge categories above $100,000, as they account for much less than 1% of the total. Fig. 1 demonstrates how the campaigns in the data set are distributed among the different pledge categories. An important factor extracted from the research is the average amount of money that contributors donate in exchange for the rewards offered—which we call the average pledge per backer. At the table on Fig. 2, we notice that projects that raised larger amounts of money had, on average, larger contributions from their backers. We take note too that the average pledge per backer, in the aggregate, is $62. Particular music genres, of course, are different to the average. Another factor is the historical distribution of rewards chosen by contributors. There are multiple tiers of rewards offered in a crowdfunding campaign. 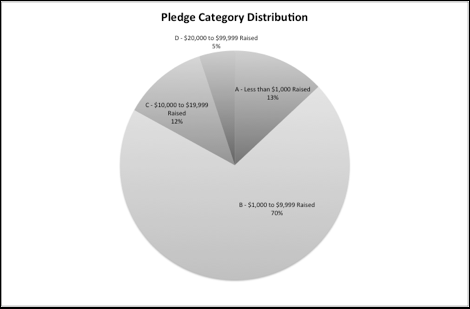 In Figure 3 we aggregate the different pledge amounts into reward tiers and calculate the percentage of backers that contributed to each tier (‘undisclosed backers’ are contributors that either decided to simply donate their pledges without receiving any rewards in exchange, or preferred not to disclose to each tier they have contributed). The data set of Figure 3 provides in-depth insight into the history of successful music campaigns. We now discuss our budgeting methodology. There are significant costs associated with running a crowdfunding campaign that should be considered when setting a final goal. Our formula factors in those costs and returns a corrected goal value. Each part of the formula is elaborated below. The band already has $12,000 in savings, so only $8,000 will be required. A common mistake in crowdfunding is to set the goal of the campaign at $8,000. According to the statistics mentioned above, the project would fit into the most successful pledge category, considering that more than 70% of the successful music projects raised between $1,000 and $9,999. However, as we are going to demonstrate, for this campaign to be viable, the goal must account for several other costs beyond the initial budget required for the realization of the project. Apart from the amount necessary to realize the project there are costs associated with the rewards being offered for different contribution tiers. It is common in crowdfunding campaigns that at every new reward tier a new perk is offered alongside the rewards from the previous tiers. Hence, every new tier should include the costs of previous tiers when estimating costs of production. 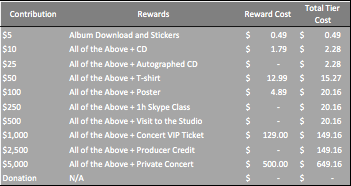 Below is a list of rewards created for our campaign. We can see from Fig. 5 that the cost of every reward factors in the costs of previous rewards. It is important to think creatively when defining rewards, adding value to each level without necessarily increasing the costs. In the example, autographed CDs are more appealing for fans then regular CDs, and there are no significant costs associated with an autograph. Hence, the margins of return are higher, especially for the most popular reward tiers, between $10 and $50. Additionally, it is imperative not to underestimate the costs for shipping and handling rewards. If the projects scales and there is no provision for shipping costs, most of the proceeds from the campaign might end up having to be spent in fulfillment, instead of being used to finance the project. Historical data plays an important role in estimating the costs of rewards. 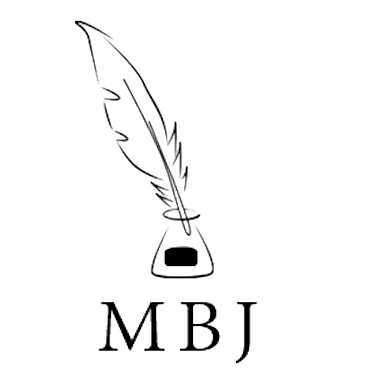 Dividing the initial budget goal by the average contribution per backer found in Fig. 2, i.e. $62, we estimate the number of contributors necessary to reach the goal. Then, applying the distribution of backers from our research in Fig. 3, we can estimate the number of contributors in each tier–thus predicting the total costs of rewards. The total cost of the rewards can then be expressed as a percentage of the total, and it maintains that proportion in any goal that is set; see Fig. 6. In this particular example, we observe that with the given costs of rewards, the percentage of the total money raised that is going to be spent on rewards is 12.95%. Manipulating the costs of each reward might significantly change the percentage destined to rewards fulfillment. Notice that results can be updated from the latest Kickstarter data, extended to other sites such as Indiegogo, and even broken down by musical genres, pledge categories or other relevant factors. Even when historical data from older projects do not seem relevant for a new crowdfunding campaign, the methodology has its use: a subjective distribution of rewards can be guessed, together with its average backing, to reveal the likely cash goal. The Kickstarter business model is based on retaining a small percentage fee of 5% from successful campaigns. Additionally, there are payment-processing fees that in the case of Kickstarter are collected by Amazon Payments. The fees for handling the money average between 3% and 5% of the total money raised.16 Other websites such as Indiegogo or Pledge Music have different fee structures, and budgets should be properly adjusted to reflect the processing fees of the platform in use. Beyond the costs of the rewards and the fees charged by platform, project owners should expect to pay taxes on the money raised via crowdfunding. Kickstarter and its payment processor, Amazon Payments, are required to send a 1099-K Form reporting “Merchant Card and Third Party Network Payments” to the IRS for any project that exceeds $20,000 with more than 200 transactions.17 The taxes owed for a crowdfunding campaign vary in every case, and might include federal income tax, sales tax, gift tax, and self-employment taxes, among others. On the other hand there are a series of deductions and tactics that can be applied in order to reduce the amount owed. Furthermore, the type of business entity chosen by the project manager, as well as the accounting method used—accrual, or cash basis– significantly impact how taxes are going to be handled in any specific campaign. In the paper we think it is reasonable to allocate 10% of the final goal for taxes. The figure is speculative and dependent on the means of the project manager. If crowdfunding monies are perceived as income, we’ve erred on the side of less wealthy individuals, who would not be paying the highest income tax rate. A less likely scenario would be if an aggressive tax professional could justify rewards for a particular campaign as just donations. In that case, the tax rate would be non-existent, although the fees of the tax professional would need to be accounted for. It is advisable to consult with a professional accountant in order to properly estimate the amount owed. The last item in the budget is a contingency factor for unforeseen expenses. This is an arbitrary percentage set to cover unexpected costs in general, including extra costs of fulfillment or taxes. To illustrate the necessity of a contingency factor, a possible scenario could be if one of the rewards offered in a specific tier is a t-shirt, and 26 people are expected to receive that reward, but the manufacturer requires that the minimum order be for 50 t-shirts; costs would be higher than expected. Once a contingency factor is considered, it can add a degree of flexibility to the collection process. A 5% contingency is set in this sample budget. We have said that a common mistake is making the goal of the crowdfunding campaign identical, or almost identical, to the initial budget goal. As can be seen from the projections in Fig. 7, the band would be setting itself up for some economic hardship with $8,000 as their goal. 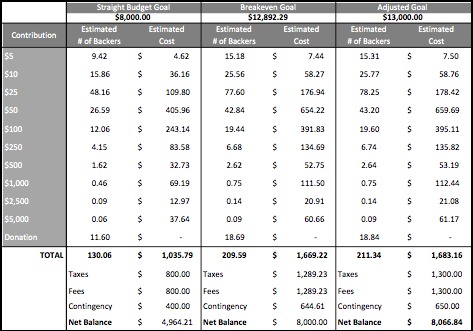 Applying the budget formula, however, it is easy to estimate a breakeven goal. We recommend adjusting results to a round number to play it safe. Note that in this example the band was using $12,000 from their savings, and needed $8,000 from crowdfunding, so in order for the band to really breakeven they would need to recoup their $12,000 either by exceeding their goal with pledges from the campaign, or in future sales of the album. The formula also provides useful insights about the number of contributors necessary to reach a given campaign goal. A project owner can better evaluate his or her chances of success by (i) comparing the number in the model to his or her actual fan base, (ii) make judgments about Facebook friends and Twitter followers that may turn into backers, and (iii) generally set standards for a more targeted marketing and public relations effort. Crowdfunding is not for the faint of heart, but properly harnessed, it can help artists and creators achieve their goals. There is substantial work involved at every step of the way, starting with the pre-production of the project, continuing through the execution of the actual campaign, and ending well only after the hurdles of fulfillment are overcome. Sound budgeting is at the core of any serious attempt at the medium. But, right now, crowdfunding needs to be infused with a healthy dose of realism. It can be done better and produce more successful and sustainable campaigns. We provide an Excel template to that end. The spreadsheet, which makes our methodology clear, can be (i) adapted for specific music campaigns by desired goal or genre, (ii) used in the simulation of different scenarios and for data updates, and (iii) extended to non-musical projects; once again, please see http://bit.ly/13taRoN. 1. Alhadeff, Peter, Luiz Augusto Buff, “The JOBS Act and the Music Business”, The Music Business Journal, Dec. 2012, http://www.thembj.org/2012/12/the-jobs-act-and-the-music-business/. 2. ArtistShare, About Us, June 2013, http://artistshare.com/v4/About. 3. Palmer, Amanda, Amanda Palmer: The new RECORD, ART BOOK, and TOUR, Kickstarter, May 2012, http://www.kickstarter.com/projects/amandapalmer/amanda-palmer-the-new-record-art-book-and-tour. 4. Ouya, Ouya: A New Kind of Video Game Console, Kickstarter, July 2012, http://www.kickstarter.com/projects/ouya/ouya-a-new-kind-of-video-game-console. 5. Crowdfunding Industry Report, Crowdsourcing.org, May 2012, http://www.crowdfunding.nl/wp-content/uploads/2012/05/92834651-Massolution-abridged-Crowd-Funding-Industry-Report1.pdf. 7. Kickstarter Stats, Kickstarter, June 2013, http://www.kickstarter.com/help/stats. 8. Steinberg, Scott, The Crowdfunding Bible, 2012; free pdf available at: http://www.crowdfundingguides.com/The%20Crowdfunding%20Bible.pdf. 10. Kickstarter School, Kickstarter, June 2013, http://www.kickstarter.com/help/school#creating_rewards. 11. Anon., “Choose Your Goal and Deadline”, Indiegogo, June 2013, http://support.indiegogo.com/entries/21004972-Choose-Your-Goal-and-Deadline. 12. B, Nic, “Where to Price Your Perks”, Indiegogo Blog, Oct. 2011, http://blog.indiegogo.com/2011/10/where-to-price-your-perks.html. 13. Rochethub Success School, Rockethub, June 2013, http://www.rockethub.com/education/launch. 14. McNelly, Lucas, “100 Films: How to Correctly Budget Your Crowdfunding Campaign”, March 2012, http://www.lucasmcnelly.com/2012/03/how-to-correctly-budget-your.html. 16. “How Kickstarter Works”, Kickstarter, June 2013, http://www.kickstarter.com/start. 17. Anon., “Do I Owe Taxes on Kickstarter Project Money?”, Aull & Cooper CPAs PLLC, Feb. 2013, http://www.aullcooper.com/small-business/do-i-owe-taxes-on-kickstarter-project-money/. You lost me when you used the pronoun “her” to mean anyone, male or female. What about MY own project as a male? The whole point of the feminine pronoun revolution in the 70s was that HIS could not be accepted by women as meaning HER. Why then are the authors asking myself as a male to accept that HER can now mean HIM? Please stick with the more accurate “he or she”, or “they” or “one”. Make your article about crowd funding, not about tacitly advancing a problematic view of gender equity and grammar. Incidentally, I’ve noticed that male authors particularly overuse “she” to mean he or she. No doubt the authors “mean well,” but their pronominal usage always strikes me as hypocritical Chauvinism. I would love to get crowdfunding to help me because I know my songs will be successful,on radio airplay I got alot of listeners tha love music,can you please take this into consideration to whom this may concern, can you please give me a call thank you GOD bless. I would love to get crowdfunding to help me because I know my songs will be successful,on radio airplay I got alot of listeners tha love my music,can you please take this into consideration to whom this may concern, cwan you please give me a call thank you GOD bless.